A rectilinear angle or angle is the "steepness" between two straight lines. The point at which the lines intersect is called the vertex. 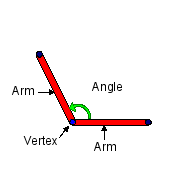 The parts of the line that extend from the vertex and surround the "steepness" are called the arms. This angle is measured in degrees (parts of 360). This angle can also be measured in radians. An obtuse angle is one where the magnitude of the angle is greater than a right angle, but less than a straight angle. 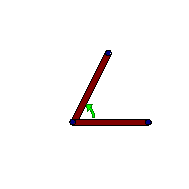 An acute angle is one where the magnitude of the angle is less than a right angle. 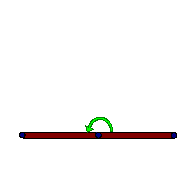 A straight angle is the angle formed on a straight line. It is equal on both sides of the line. It is equal to the sum of two right angles. This page was last modified 11:20, 22 October 2008.